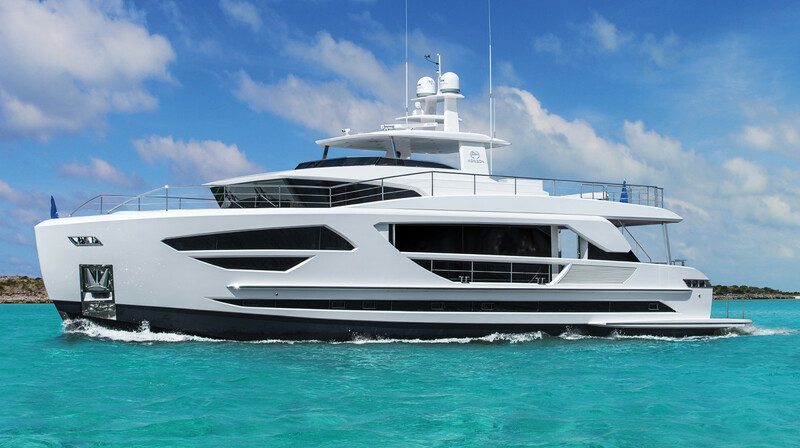 Borrowing lines from the superyacht world, the Horizon FD85 is a stunner with universal appeal. 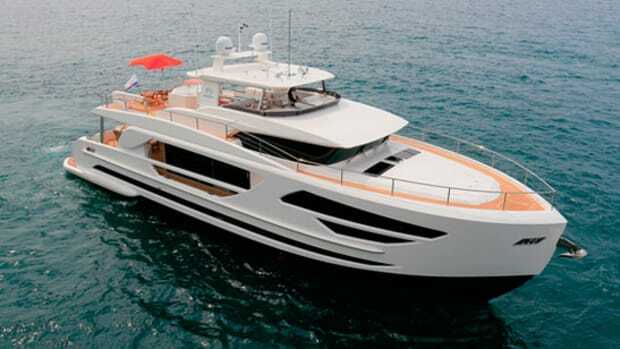 Horizon borrows lines and design elements from the superyacht world to give its new FD85 universal appeal. I admit that I have always been wary of boats where water runs forward off the bow, although I’ve owned a number of reverse-sheer sportfishermen and even some go-fast boats that had waterfalls off their anchor roller. Still, I wasn’t a real fan. Until I met the new Horizon FD85. It’s so cool that I don’t care which way the water drains. 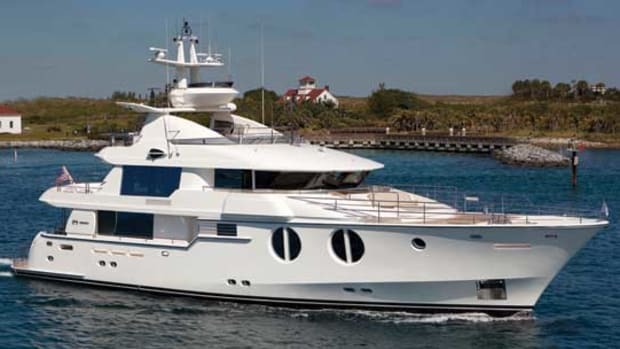 Silly me, I assumed the FD meant “Flush Deck” when, in fact, it translates to “Fast Displacement.” This means you get superyacht cruising speeds in a smaller package—think a 1,400 nautical mile range at 10 knots, although the FD85 can still lift her skirts and produce a get-home top speed of over 20 knots. Ten knots may be too slow for many, so Fast Displacement means she’s equally comfortable at cruising speeds of 12 to 14 knots. Drop back to 6 knots and you can go nonstop Miami-Gibraltar with safe reserves. But to really understand the cleverness of the FD85 layout, skip the usual tour starting in the salon. 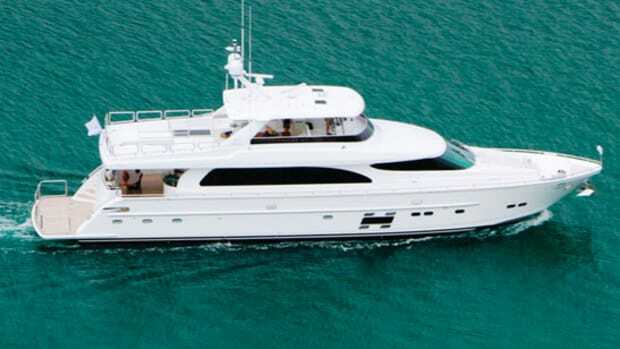 Go straight to the flybridge, which is also the upper deck, which is also the foredeck. Confused yet? A look at the profile will show you that the flybridge slopes gently forward to become the foredeck. There is a raised pilothouse that pops its head above this deck, giving the skipper direct access to the foredeck when needed. But it also creates a humongous full-beam bridge that could host Dancing with the Stars. Our test boat, Hull No. 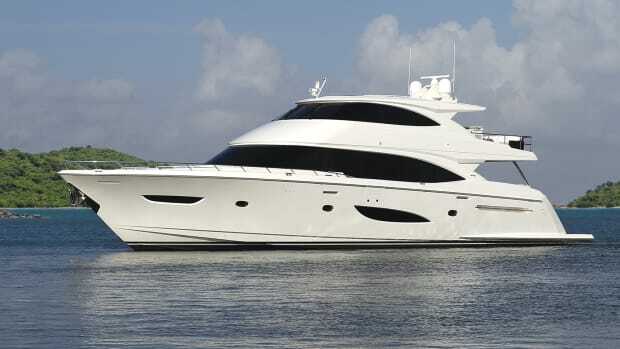 3, has a large sunpad and leaves the deck space open to carry water toys and tenders launched with a Steelhead 1,500-pound crane, while an earlier 85 opted for a Jacuzzi spa in mid-deck. 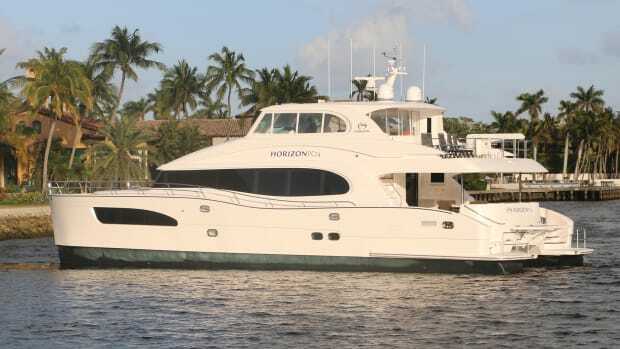 Either way, guests can stroll forward on either side of the fiberglass hardtop, where they’re protected by high bulwarks and rails, to enjoy the large sunpad on the foredeck, while crew have a mini-cockpit all the way in the bow with anchor gear (and a drain for that rainwater). It’s a slick design that maximizes the usable size of the bridge, which has the expected L-shaped bar with four stools, a comfy dinette and an outdoor kitchen with grill and fridge. At the forward end is the helm to port with a double- or triple-wide seat (depending on your beam), a forward-facing companion seat and direct access to the pilothouse. 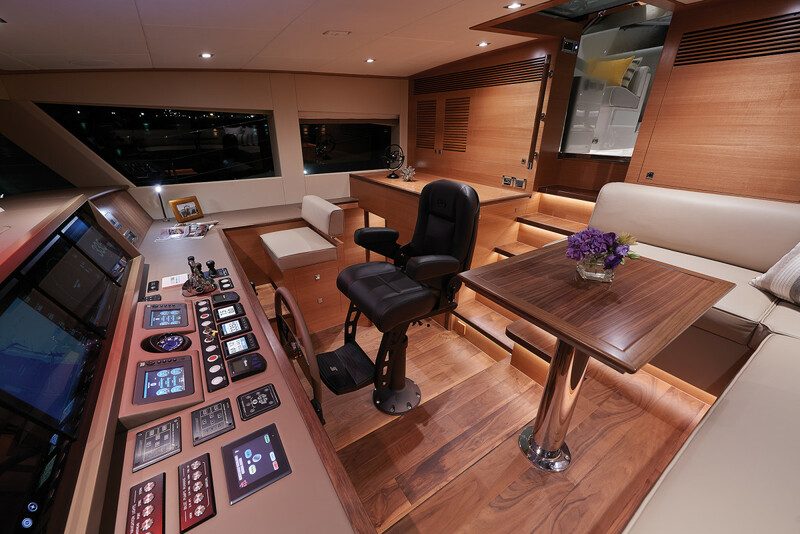 There, the skipper has some privacy with a pedestal chair behind the upholstered but thoughtfully arranged dash with four monitors—because the pilothouse has a reversed windshield, there are no distracting reflections on those screens. An L-shaped settee to port is for guests or crew to hang out while underway. 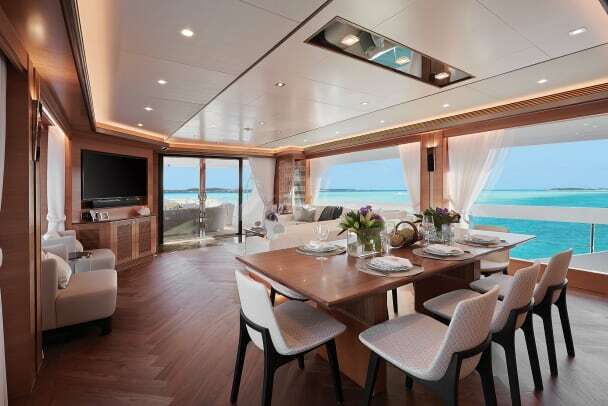 What you don’t realize is that this bridge-to-foredeck layout also creates immense space on the main deck of the FD85, which, like modern superyachts, has an owner’s suite forward. A private hallway from the salon is mere steps away from the pilothouse; enter the suite and you’ll find a cool and airy space with windows that seem to flow from floor to ceiling around a centerline king-size berth. Because of the plumb bow (more later), there is a spacious head forward with twin vanities and a marble-lined shower. This suite is finished with a walk-in hanging locker, a window seat to port and, on our 85, a leather chair to starboard that fairly begged me to settle in with a good spy novel. 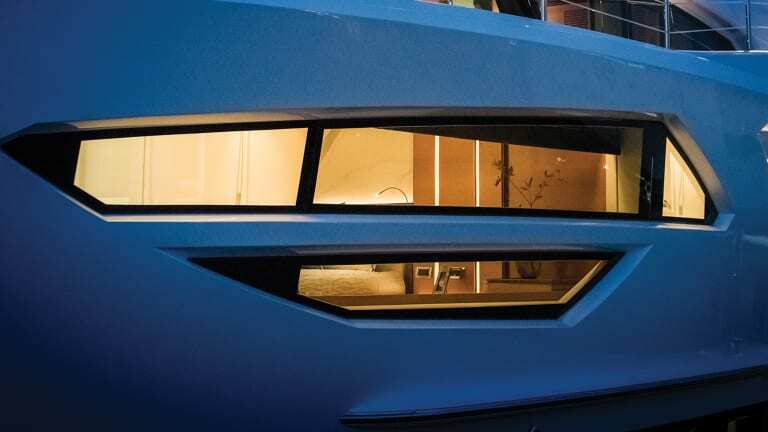 Certainly the most striking features of the saloon are the floor-to-ceiling windows, making this a floating villa with ever-changing scenery. Even the exterior bulwarks have been cut away so that nothing intrudes on your view. But we all know that there is a downside to large windows: heat. In this case, the Horizon designers are ahead of the game by specifying low-emissivity glass (Low-E) that knocks down the infrared and UV rays from .84 (uncoated glass) to just .02. Cool—literally. Forward in the saloon is a teak dining table for eight, served by a galley hidden out of sight to port. 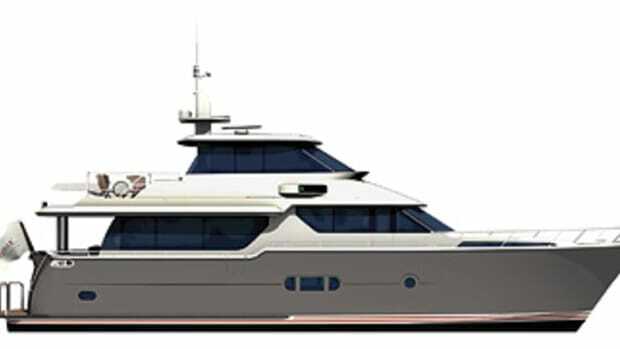 That galley, with marble floors and wraparound counters, is going to make some chef very happy, and a door to the side deck means no toting provisions through the guest areas. The galley is pretty much a one-person operation with the compact size discouraging hangers-on, which may please the chef. From the reverse windshield at the pilothouse to the anchor, it’s clear the FD85 has passagemaking DNA. That is especially true at the helm. Aft, in the saloon, is an entertainment area with a built-in L-shaped couch and loose chairs facing a large-screen TV in one corner, while a glass-fronted hutch shows off glassware from wine goblets to champagne flutes. But this may not prove to be the most popular guest area, especially if the weather is pleasant. The after deck is fully shaded (another benefit of the huge bridge) and can be easily fitted with a soft enclosure for cooler climes, but for most conditions, it’s an absolutely delightful alfresco gathering spot for owners and guests. Protected on each side by the double stairwells to the bridge (one side has a TV, the other has stairs down to the crew quarters), this is a most gracious and inviting lounge area. A settee is aft, while a pair of loose chairs and a couch complete the area, with a flawless teak deck underfoot. And tucked out of sight just inside the salon slider is a day head to starboard. So where do all the guests stay? They have the entire lower deck to themselves, with three equally sized VIP suites and a smaller guest cabin with twin berths that’s perfect for kids. Stairs from the salon hallway lead down to a mini foyer on the lower deck with a separate laundry room (your crew will kiss you). 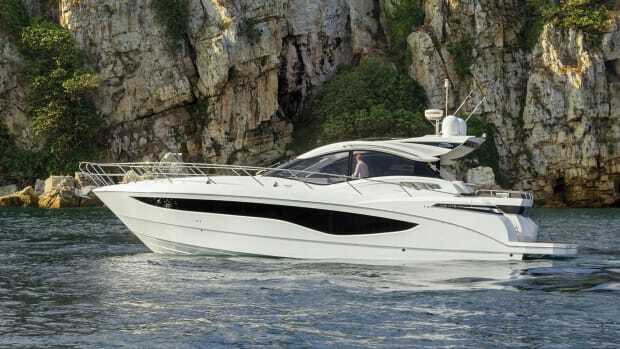 All the way forward on this particular FD85 is a queen-size VIP and, just abaft the foyer, two more mirrored VIPs of equal size, also with queen berths. Each is en suite, with pocket doors to the heads to conserve space. Judging by the varied layouts for each of the FD85s so far, Horizon is happy to create a lower deck layout to fit your needs. Standard power for the North American FD85s comes from twin Caterpillar C18 ACERT diesels, and the two produce 1,600 horsepower each. They live in a spacious engine room for an 85-footer. Optional twin Onan 29 kilowatt gensets (or standard 22.5 kilowatt) are as accessible as the Cat mains and, once again, both your crew and your service personnel will appreciate the thoughtful and seamanlike execution of the systems. Guests will like the heavy insulation package that knocks down both sound and vibration while underway and at rest. Speaking of crew, they’ll be pleased with their quarters that have safe access via cockpit stairs in all weather, while a pantograph door opens to the swim platform for harbor use. Two cabins with bunks are served by a gleaming head with shower, and the crew mess has a mini-galley and dinette seating, allowing the crew their own getaway. So what is the “High Performance Piercing Bow” (HPPB) that Horizon touts as one reason for the efficient cruising performance? Well, it’s more than just the bow. 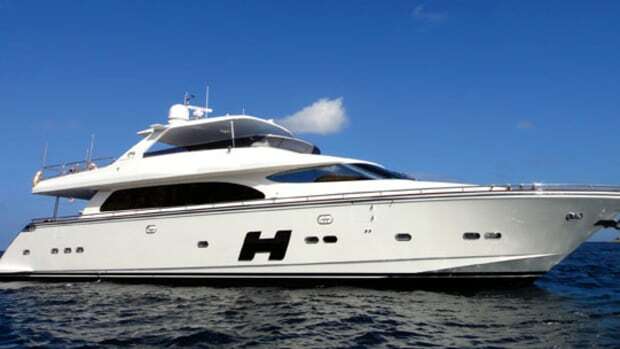 It seems as though Dutch designer Cor D. Rover, who regularly designs superyachts over 220 feet, tossed a bunch of ideas into a Cuisinart and hit “blend.” Follow me on this: The hull of the FD85 starts with a plumbish bow that morphs into a piercing bulb, which protrudes forward. Every tanker and cruise ship has one of these, because the bulb “tricks” the ocean into thinking the ship is much longer and thus has a higher displacement speed. OK, moving aft, you can see from photos there is a hard chine that starts above water and extends below to throw spray out to the side and further soften any pitching with chine lift. Midships and aft, the hull has a soft chine to reduce resistance at hull speed along with a long centerline skeg to provide directional stability. Last, the hull has tunnels to reduce drag and to recess the props and rudders to a draft of 5 feet 9 inches for skinny-water exploring. 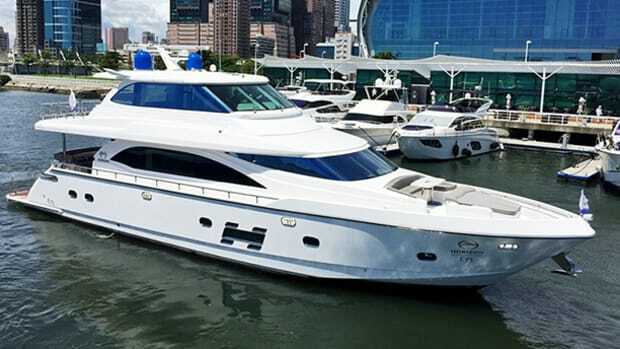 Horizon describes the new FD85 as an “85-footer with a 100-foot attitude.” I think they’re being modest: This is not only a remarkable yacht, but also a whole lot of yacht in an easily managed size. And I don’t care which way the water runs off the deck. Load: 1,000 gal. fuel, 100 gal. water, 8 persons. Speeds are two-way averages measured by Garmin GPS display. GPH taken via Caterpillar engine display. Range is 90% of advertised fuel capacity. Sound levels taken in the pilothouse. 65dB(A) is the level of normal conversation.